Undefeated Nyquist Wins Florida Derby and Heads to Louisville: Reddam Racing LLC’s Nyquist maintained his undefeated record with a commanding 3 ¼-length triumph in Saturday’s $1 million Xpressbet.com Florida Derby (G1) while establishing himself as the top candidate for the 2016 Triple Crown. The Doug O’Neill-trained 3-year-old colt ran his career record to 7-for-7 while sweeping to victory in Gulfstream Park’s signature race, in which the son of Uncle Mo faced previously undefeated Mohaymen in the highly anticipated unprecedented West vs. East matchup. The anxiously awaited showdown between Nyquist and Mohaymen developed at the top of Gulfstream Park’s stretch, but the Southern California-based 6-5 second betting choice pulled away to a convincing score under Mario Gutierrez as the East Coast-based 4-5 favorite weakened in mid-stretch to finish fourth under Junior Alvarado. Nyquist, the 2015 Eclipse Award-winning juvenile, made a most lucrative return to Gulfstream Park, where he was purchased in the 2015 Fasig-Tipton Florida sale for $400,000. In addition to earning the $600,000 winner’s share of the $1 million purse in his first start at Gulfstream, Nyquist also earned a $1 million bonus offered by the sale company to any graduate of the 2015 sale that went on to win the 2016 Florida Derby. Wagering on Saturday’s 14-race program, which included eight stakes worth $2.4 Million in purses, produced a Florida Derby Day record handle of $32,082,270, eclipsing last year’s total handle of $27,255, 586. The $32.082 Million figure also represented the highest handle ever recorded at Gulfstream other than on Breeders’ Cup Days. 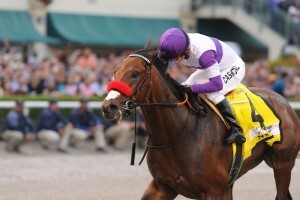 Nyquist became the first West Coast invader to capture the Florida Derby since Empire Maker (2003) and the first Eclipse Award champion to prevail in the important 1 1/8-mile Kentucky Derby prep. 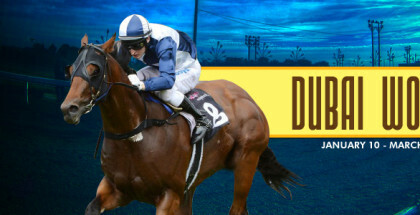 As he embarks on the Triple Crown campaign, he will attempt to follow in the footsteps of I’ll Have Another, the 2012 Kentucky Derby and Preakness winner who was owned by Paul Reddam, trained by O’Neill and ridden by Gutierrez. Nyquist broke alertly from the starting gate to lead the 10-horse field into the first turn and into the backstretch under a firm hold by Gutierrez in his second start of 20016. He was rated on the lead along the backstretch, pressed on the inside by Sawyer’s Mickey and on the outside by Chovanes. “It was always part of the plan (to go to front). It just depends on the break; how the other horses were going to be acting, so coming out of the gate, I broke so clean and so fast so I just had to take the lead,” Gutierrez said. After putting away the longshots heading into the far turn, Nyquist was joined to his outside by a Mohaymen leaving the turn into the homestretch. As Nyquist and Mohaymen rounded the final turn extremely wide, Majesto, a 21-1 long shot ridden by Javier Castellano, cut the corner to join the fray. Mohaymen began to struggle in mid-stretch as Nyquist responded when asked by Gutierrez and scooted to a comfortable win. Majesto held second, a length ahead of a late-charging Fellowship, who was four lengths clear of Mohayman. 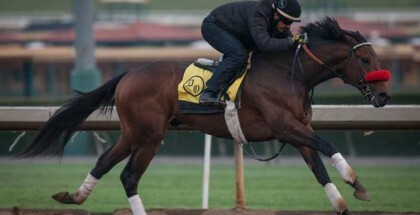 In addition to Nyquist, who is likely to be favored in the Kentucky Derby, Majesto and Fellowship earned sufficient qualifying points to join him at Churchill Downs May 7 should his connections opt to run. Nyquist ran 1 1/8 miles on a ‘good’ track in 1:49.11 on fractions of 23.60 (seconds), 47.09, 1:11.39 and 1:36.38. “I saw the gray horse (Mohaymen) coming to my side. I’m riding the race and I didn’t want to be so confident, so if he was going to pass me, he was going to have to pass me running and wide,” Gutierrez said. Mohaymen was unable to sustain his bid. Grupo 7C Racing Stable’s Majesto made a giant leap forward in his first race since breaking his maiden at Gulfstream Feb. 27 in his fifth career start for trainer Gustavo Delgado. Jacks or Better Farm’s Fellowship came into the Florida Derby off a pair of late-running third-place finishes in the Holy Bull and Fountain of Youth for trainer Stanley Gold. “I had a good trip. We broke and I got the position I wanted. When I asked him, he gave me a kick, but the other two kept running,” Lezcano said. Mohaymen, on the strength of his Holy Bull and Fountain of Youth wins, has also earned a berth in the Kentucky Derby field. Florida Derby starters have won 22 times in the Kentucky Derby (G1), the most recent winner being Orb, who parlayed a victory in the 2009 Florida Derby into a triumph at Churchill Downs on the first Saturday in May. Horses that started in the Florida Derby have gone on to capture a total of 57 Triple Crown races. Nyquist is scheduled to be shipped to Keeneland Race Course in Lexington, KY at 9 a.m. Sunday to prepare for a quest to give Reddam his second Kentucky Derby success.